Today we are talking about how we can pick holiday colors that complement our brand. 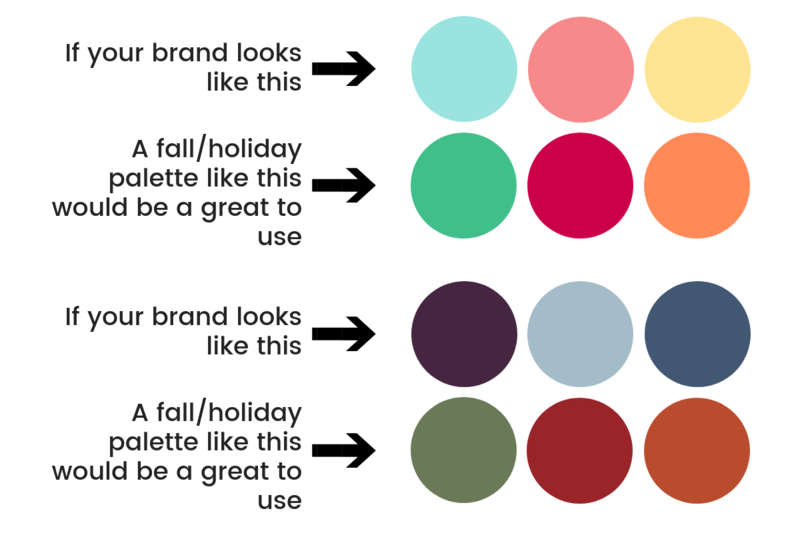 Can I ditch my brand colors for my holiday printables and/or holiday pins? Yes! You can, and should use holiday-appropriate colors for your holiday-related content! The key here will be identifying colors that work well with your brand personality and doesn’t clash with your current palette. 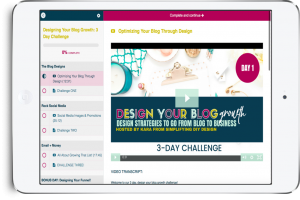 There’s a couple of options I want to talk about here and I’ll use examples from my blog and also from another awesome blogger. First, we’ll talk about switching up the colors while keeping the same brand style. Then, I’ll show you an example of going way off brand and why it’s OK. Lastly, we’ll talk about choosing the right holiday colors and shades for your brand. The first pin, How To Organize Children’s Clothing is designed in her brand style with her normal brand colors. 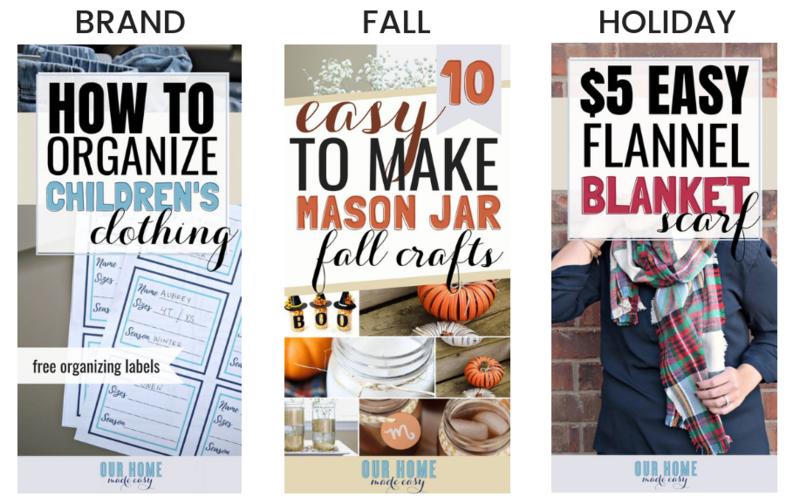 The second pin, 10 Easy to Make Mason Jar Fall Crafts, is obviously fall-related content. You can see she picked a nice orange shade that complements her normal blue brand color but it gives the whole image a very fall-like vibe. Not to mention, she used images that pull that orange out even more. Lastly, there’s the $5 Easy Flannel Blanket Scarf, that has been created with a red color to signify the holiday seasonal content. The shade of the holiday colors she used should be noted here. Notice how her normal blue color is very soft and muted. So naturally, she wouldn’t want to pick a bright orange like a traffic cone or a stop sign color red. We will talk a little more about that towards the end of this article. This is a GREAT example of someone who changed absolutely nothing about her pin and brand style other than the seasonal color and it totally works. Not only do the colors complement each other nicely but the style and layout are exactly the same, the font technique and fonts used are the same so the brand consistency has been maintained perfectly. Next, let’s talk about going way off brand when choosing colors for your holiday content. Here’s an example from my own site. The first two are brand styles I use often. The fonts and colors are consistent, the font techniques used are consistent, and while the body style varies a bit (The green one being an earlier style. The white one being my newer style) they are pretty brand consistent. The image on the right is a holiday printable I created for my site. 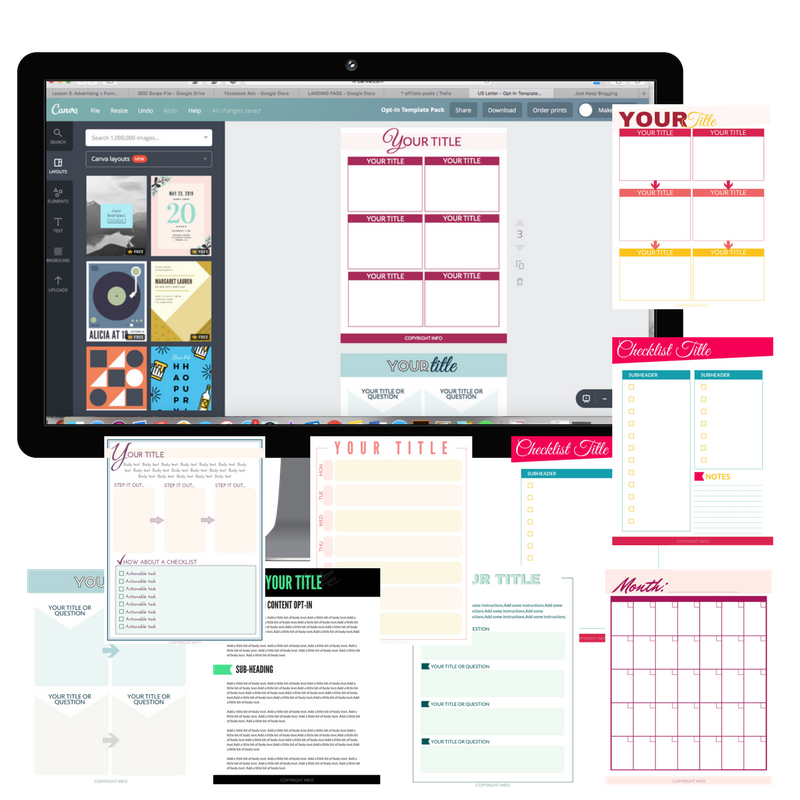 PS- this is a blog holiday content planner and it’s located in my design library if you want to grab it for free. If you don’t have the password to my library, just click right here. Notice how it’s COMPLETELY OFF BRAND. The colors are different, the fonts are different, I didn’t use my font technique, even the checkboxes are circles instead of squares. Here’s the thing, I just don’t stress about this stuff very much. Ironic, since I’m the “design girl” right? I just wanted to make a pretty holiday printable and that’s what I came up with. I think it’s important to note that this a printable, NOT a pin or social media graphic. This is printable is for my subscribers. The pin used for the post (while the colors I used differ from my brand, the style is brand consistent- like Brittany’s examples) and the printable itself won’t appear on social media, just the graphics I created for the post. I will note that because I went so off-brand, this printable took me significantly longer to create. I had to play with colors, font pairings, and styles I didn’t normally use. 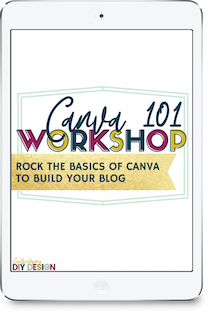 When creating graphics and products with a branded style, you save a ton of time because you don’t have to think about the colors, fonts, or layout as much. Check out this article if you want to learn more about brand consistency and what it can do for you and your blog. The suggested colors are Christmas (and orange for the fall season). If you celebrate or talk about different holidays, your color choices will obviously vary. However, the important thing to note here is the shade and the overall “feel” of the colors. The first example is a brighter, lighter color palette. So the seasonal colors are also bright and light. This gives off a happy, joyful vibe. The second example contains darker, muted/soft colors. So the complimentary seasonal colors are darker, muted, and softer– much less vibrant. This gives off a homey, comfortable vibe. Another option for choosing holiday colors is by choosing a holiday pattern that you want to use in your holiday content and pulling colors from that. Let’s go back to Brittany from Our Home Made Easy for this example. This is similar to choosing a brand pattern and using it in your products, social media graphics, and website. Instead, we’re choosing a holiday pattern that fits our brand style and pulling colors from that. 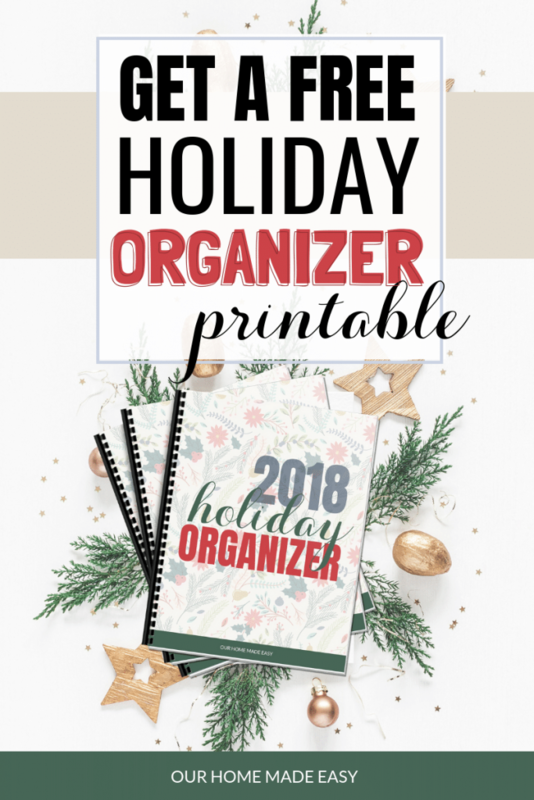 She chose a holiday pattern to use for the cover of her Holiday Organizer and then pulled the hex code of the red and green from that pattern to use for her pin and the product. There are several ways to find the hex code of an image. The EASIEST way is by using ImageColorPicker.com — simply upload the image and then click on various parts of the image. The free program will tell you the exact hex code, it’s SO easy. Do better with video? Check out this facebook live replay about choosing holiday colors! 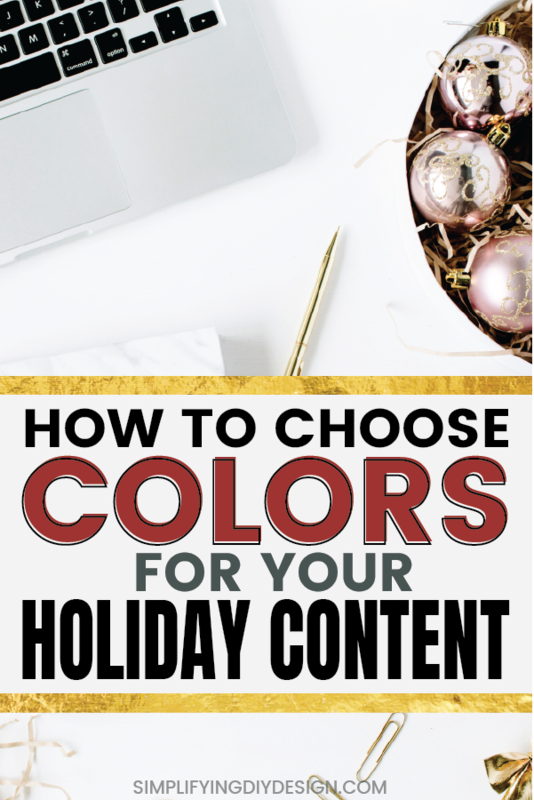 There are so many ways to choose colors for holiday content that fit your brand and drive more seasonal traffic! The best way to keep a consistent brand style is by using the same fonts and style as you normally would for your brand, just picking a complimentary seasonal color to accent the image with. You can go really off brand if you want to, however, I would generally recommend at least keeping that branded style for your social media graphics and pins. 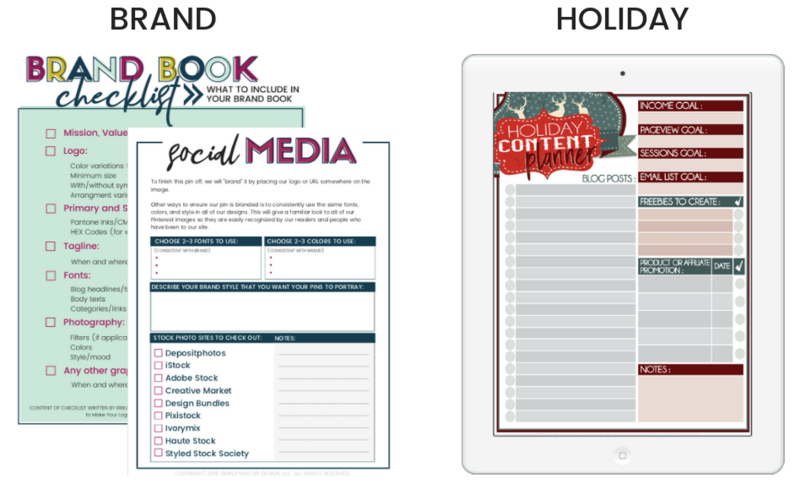 Printables or holiday products have a little more flexibility, but social media is where having a branded appearance is most important. Choosing the right colors and incorporating patterns that pair well with your brand can give your holiday color palette that extra kick! 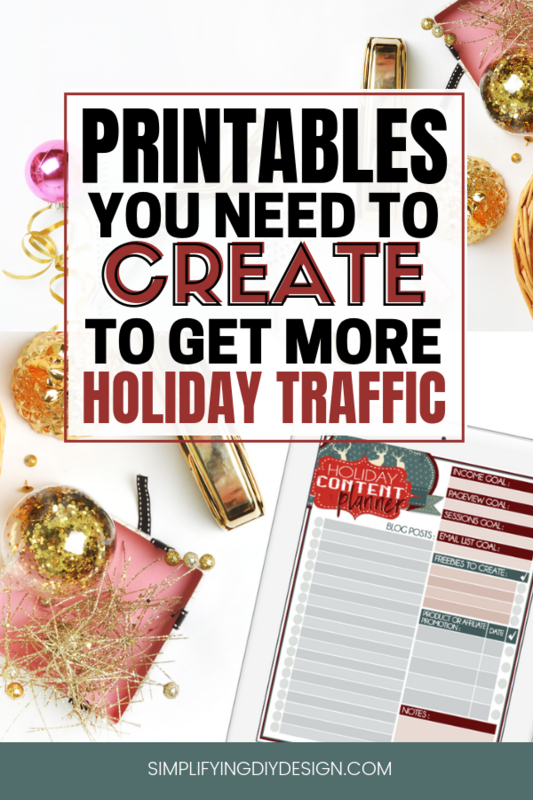 Seasonal content is GREAT for holiday traffic, so make the most of it! Want to join our free 3-day Design Your Blog Growth challenge and get 3 days of actionable design tasks that will help grow your blog faster? Click right here to sign up!